Kimara's playful rapport with an audience, movement technical precision, fusionary style, and obvious love for dance and entertaining has resulted in referrals and repeat business for twelve years. She takes care in helping clients make their event a memorable one. Shows can be customized to suit the event or theme including music and costuming. Kimara has been hired by Greek, Hispanic, Italian, Indian, Moroccan, Egyptian and Turkish families so she keeps a huge assortment of music and will gladly customize the music to fit the show and please the crowd. 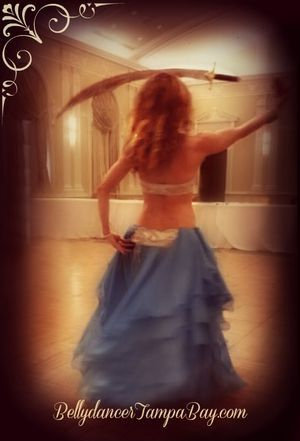 Zills (finger cymbals) are always included in a song or two, but extra implements can also include Sword-Bellydance or Firedance/Fire eating, Veil dance, Raks al Assaya (folkloric Egyptian cane dance). She also gets the audience involved, creating fun photos for you and your guests. - A fast lively entrance with zills (finger cymbals) to upbeat Turkish/ Greek/ Arabic music (or genre of your choice). This is normally a time for 'breaking the ice', acknowledgement of all guests especially guest(s) of honor being celebrated. - A slower dance, sometimes performed with a silk veil. It is imporant to specify if there will be a stereo present and what music format it will accommodate.. ie CD's, Phone, Ipod. If you will have a DJ at your event please confirm with them which format/device their system will accommodate. Prices can vary depending on travel, length of show, number of shows, number of costumes. Show lengths are flexible depending on client's needs. Every show and circumstance is different, the following are general local industry price ranges. Two 20 minute shows (no costume change): $200. 30 minute party show $150. Regularly ongoing booked appearances in establishment at least four weekend nights per month. For a one-time restaurant appearance, private party price applies). Show times vary and are flexible depending on restaurant's needs and/or crowd-flow, the following is a general range. Two 15 to 25 minute shows (no costume change): $100. For charities and ACLF's discounts apply, please inquire. Thank you for contacting me. I will get back to you as soon as possible to answer questions and plan your show for your event!